Brilliant hostel with lovely staff and great location and facilities! Location is great!!! Plenty of restaurants and shops. Walking distance from public transportation. Staff was helpful when I arrived. She gave me a map and pointed out the key locations to visit. I got a private room. It did the job, had a single bed and a desk. The restrooms were cleaned each morning. Showering around 11am guarantees you a clean restroom, since that’s the time house keeping comes around. You have to use the stairs to get to each floor, so pack light! Me and my friend booked a private room which was perfect for us in terms of facilities and location. The staff were always so friendly and made us feel very welcome. Would definitely recommend this hostel for small groups! 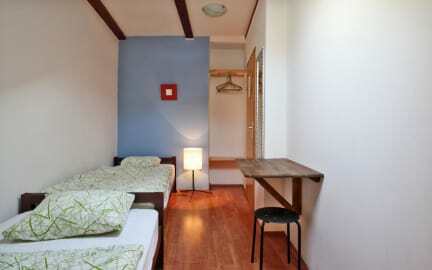 Located on a lively street with lots of cafes and restaurants. Hostel is in an awesome location; you just walk out the door and are on the best street full of bars and restaurants. My room was very basic but it was clean, although smelt like smoke. the bathroom was spacious and always mean. No cooking facilities and the common area was the bar downstairs which was very dark and smoky so I didn't spend any time there. The staff were really nice and helpful. Nothing fancy but a good, cheap room in a really beautiful city! The reception boy was excellent, and hostel location is also superb. There is no rule, but generaly, atmosphere tends to be zero, because you dont have place to hang out except in a bar where is very smoky. Ps. You can not turn on washing machine at 3 am on the last floor, it's noisy and you hear loud banging at the wall. Taban was a good place to stay if you don’t mind the warm rooms (no aircon), and basic bathroom facilities. Located in a brilliant position right near the centre of town it was great to walk to everywhere from here. Lovely staff who were helpful. However the check in after 2pm policy should be amended to allow guests to check in earlier if rooms are available. No common area (other than a public bar) so it was difficult to meet other fellow travellers. Comfy bed but lots of stairs to get to it! Its very basic. Not that good except the price. they charge 10 Euros only. But the facility are very basic. Night lights of beds are not working in dorm. There is no individual charging points and common area is not available.